When you shop at local businesses, more money is kept within our community because local businesses often use or buy from local service providers, farms, and companies. Buying locally helps grow other businesses as well as our local community. 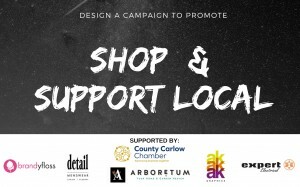 These local businesses are at the core of our community, and the County Carlow Chamber works in several ways to remind people of the importance and benefits of shopping and supporting local. One such way over the past number of years has included taking time out to meet with second level students in Carlow to discuss business, the local economy and shop and support local. This year the Chamber, working in partnership with Arboretum, Details Menswear, Swan Electrical, AK Graphics and Brandyfloss have expanded this further in a pilot programme that has been rolled out to the transition year students of Carlow CBS and St Leos Carlow. The programme sees students working in groups to design and deliver a marketing campaign which is designed to promote “Shop & Support Local” in the community. These campaigns will be presented to a panel of judges in early December where the winning campaign team and the runner up will be selected and will receive their share of the €500 prize fund in the form of Love Carlow Gift Cards. In addition, the winning campaign will feature on campaigns over the Christmas period with Love Carlow. In designing their campaigns, the students will receive expert advice and guidance from Anne Kelly of AK Graphics, an award-winning design company; and Eoghan O Searcoid of Brandyfloss, which is a Carlow based marketing agency and technology company. Commenting on the initiative, Brian O’Farrell, CEO of County Carlow Chamber said “We are looking forward to seeing the campaigns that will be delivered to the judges in December and what messages the students will come up with to promote Shop and Support Local. The programme is designed to give them an insight into some key skills and also to embrace their creative sides”.